London - Bolton Wanderers midfielder Fabrice Muamba has retired from playing professional soccer on health grounds, the English second-tier club said on their website on Thursday. The 24-year-old collapsed during an FA Cup tie away to Tottenham Hotspur in March and his heart then stopped beating for 78 minutes. Democratic Republic of Congo-born Muamba's recovery was hailed as miraculous but there were always questions as to whether he could play again. "While the news is devastating, I have much to be thankful for," said Muamba. "I thank God that I am alive and I pay tribute once again to the members of the medical team who never gave up on me." "I would also like to thank everyone who has supported me throughout my career and the Bolton fans who have been incredible. I am blessed to have the support of my family and friends at this time." Muamba was taken to the London Chest Hospital, not far from Tottenham's White Hart Lane ground, after receiving prolonged treatment on the pitch in a match that was abandoned by the referee. His plight and subsequent recovery saw the former England Under-21, international who arrived from the DRC as an 11-year-old with limited English, attract well-wishers from around the world. He received thousands of cards and among the gifts was a signed jersey from NBA star LeBron James. "Since suffering my heart attack and being discharged from hospital, I have remained utterly positive in the belief I could one day resume my playing career and play for Bolton Wanderers once again," Muamba said. "As part of my on-going recovery, last week I travelled to Belgium to seek further medical advice from a leading cardiologist. "But the news I received was obviously not what I had hoped it would be and it means I am now announcing my retirement from professional football. "Football has been my life since I was a teenage boy and it has given me so many opportunities. "Above all else, I love the game and count myself very lucky to have been able to play at the highest level." Bolton chairman Phil Gartside added: "To have Fabrice here and with us is truly amazing and we are all very thankful for that. "We are all hugely disappointed that Fabrice will be unable to return to his playing career but we have to be guided by the medical recommendations and the best interests of Fabrice. "The most important thing is that Fabrice and his family have the rest of their lives ahead of them." 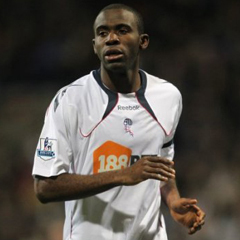 Wanderers boss Owen Coyle, who spent hours by Muamba's bedside during a season where Bolton were relegated from the Premier League, said: "We have spoken with Fab and he knows we will always support him in whatever he wants to do and that we will always be here for him. "He is obviously massively disappointed that he won't be able to carry on his career but everyone has seen what a fighter and strong person he is in mind and body."